1. For the post of Sheristadar, the candidate must have served continuously for 5 (five) years as Sheristadar in the office of the Additional District & Sessions Judge or 5 (five) years as Head Assistant in the establishment of District & Sessions Judge. 2. For the post of UDA- candidate must have served as UDA or rendered more than 5 (five) years of service as Lower Divisional Assistant in any District Court or Sub-Divisional Court as on 01.03.2018. Candidate having knowledge in computer shall be preferred. 3. 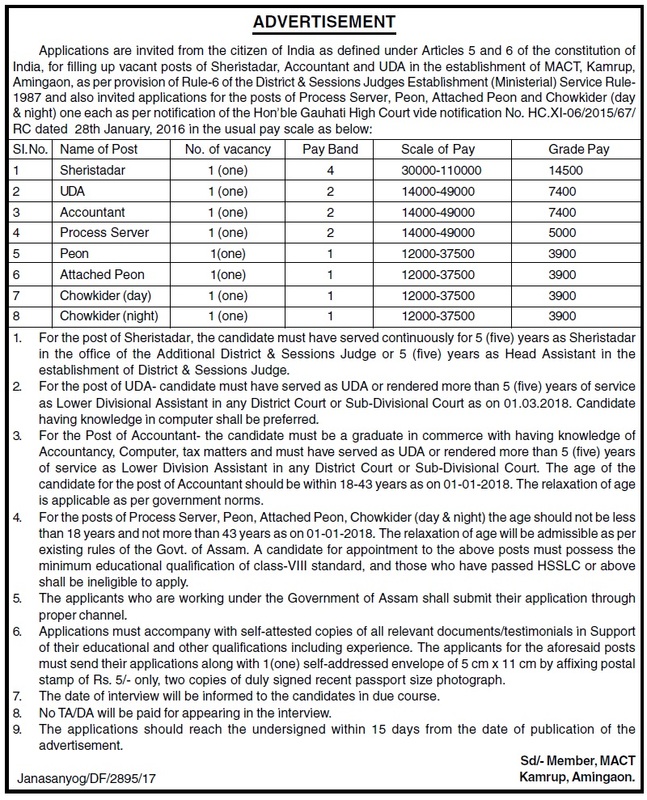 For the Post of Accountant- the candidate must be a graduate in commerce with having knowledge of Accountancy, Computer, tax matters and must have served as UDA or rendered more than 5 (five) years of service as Lower Division Assistant in any District Court or Sub-Divisional Court. The age of the candidate for the post of Accountant should be within 18-43 years as on 01-01-2018. The relaxation of age is applicable as per government norms. 4. For the posts of Process Server, Peon, Attached Peon, Chowkider (day & night) the age should not be less than 18 years and not more than 43 years as on 01-01-2018. The relaxation of age will be admissible as per existing rules of the Govt. of Assam. A candidate for appointment to the above posts must possess the minimum educational qualification of class-VIII standard, and those who have passed HSSLC or above shall be ineligible to apply. How to Apply: Applications must accompany with self-attested copies of all relevant documents/testimonials in Support of their educational and other qualifications including experience. The applicants for the aforesaid posts must send their applications along with 1(one) self-addressed envelope of 5 cm x 11 cm by affixing postal stamp of Rs. 5/- only, two copies of duly signed recent passport size photograph. Note: The applications should reach the undersigned within 15 days from the date of publication of the advertisement.